The elements above can be directly applied to your role as an educator. In BrandED, Trish Rubin and I discuss the rise of the edupreneur and how this thinking can be a catalyst for transformative change. It’s time to not just think, but also act as an edupreneur to usher in needed change. This edupreneurial persona, one based on openness, can creatively cultivate new relational value and garner trust among members of your community. See what’s worked for successful entrepreneurs who’ve met their own goals, and find a fit for your continuing professional development. While embracing the listed elements above, think about the following strategies that Trish and I believe lead to edupreneurial leadership. Relationships matter to edupreneurs. Do this in real time through face-to-face associations and with your closest validators. Use the wealth of TED Talks, webinars, and YouTube content online to get inspired. Follow the hot topics in leadership, communication, and relationship building. Start to follow them online. Connect to Mention and Google Alerts to get tailored feeds and information about those key areas you need in order to increase your own edupreneurship. Talk to people about branding and the innovative climate for school reform. Share how applying a few powerful select business strategies is empowering your school leadership. Test the waters on social media with thoughts, quotes, and content that match the topics you are advancing. See the results from your peers near and far. Don’t be afraid to ask questions about the new direction you are setting as a leader. Get feedback. Be curious and search for answers. Leverage social media or go with face-to face conversations. Just ask! Entrepreneurs work out of a passion. So do edupreneurs. There is joy in innovating, challenging the status quo, marching to the beat of a different drummer, and experiencing success through non-traditional means. Work to present yourself with a unique brand value (UBV), which is a key to edupreneurship. Celebrate every benchmark for your school. Talking about big and small tangible accomplishments is part of communicating value. It’s the small moments that create big accomplishments, the proven results and gains with the community that can complement test score reports and expand the idea of value. Join the brandED conversation to unleash the edupreneurial drive to transform education. This is a no-brainer for educators. Continue your study in the manner of a trend spotter. Look out—online, in apps, or through print resources—for the latest trends and research in leadership, pedagogy, initiating school change, technology integration, and whatever other topics inspire you. Search outside your own educational backyard to learn from other disciplines. The digital world allows us to see thousands of bits of information that can be woven into new creative thinking for growing our edupreneurial thinking and leadership. Grow your relationships upward for your community with “reach targets,” the great people you aspire to meet with whom you can share the school brand and engage for support. Grow relationships downward with those good people that complement your network. Build relationships with service providers who help students. Talk to bus drivers, crossing guards, security staff—anyone who provides support to the community—about your vision, goals, and outcomes. Finally, network horizontally with your peers and other leaders in real-time associations, and online through hangouts and chats. Invite them to share their thinking and content about education brand. Promote relationships so that deeper connections can form, leading to cobranding exchange between yourself and other leaders. 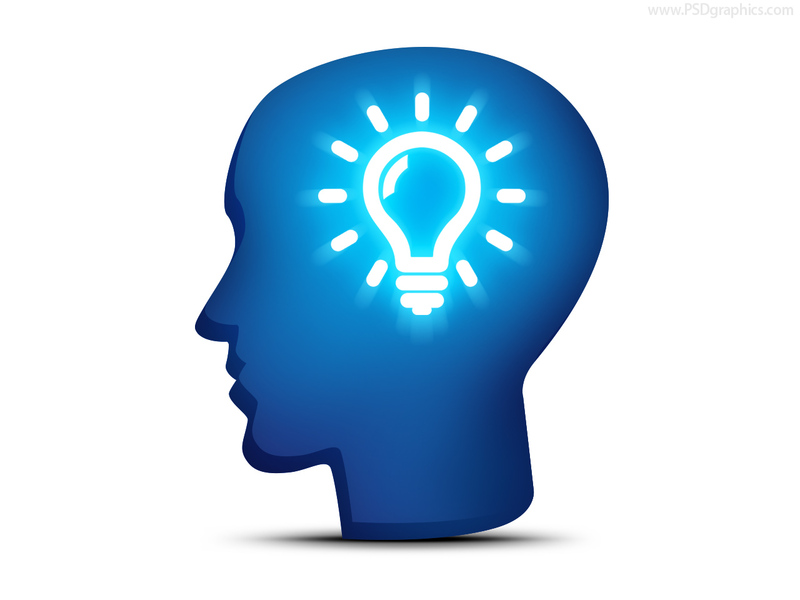 Take the time to write about your efforts in becoming an edupreneurial thinker and doer. Making visible the thoughts and reflections that are part of the journey can be the first-draft thinking that starts you on the way to sharing your personal professional brand. Entrepreneurs have the will to carry on; with that same spirit, edupreneurs don’t give up. We demonstrate our persistence on a community-wide stage. Belief is an essential part of brand development. Be the chief believer in your school brand by becoming the storyteller-in-chief. Entrepreneurs who are successful have a tendency to wait. Some entrepreneurs are actually procrastinators of the highest degree. Edupreneurs move at a pace that can ensure their success. Don’t rush the process. Focus on the work of your students, staff, and district. In time, the results of your improvement strategy will come to fruition. The time has come to not only embrace new ideas and ways of thinking, but also the way in which we employ these assets to usher in meaningful change. Content from the following post was adapted from BrandED: Tell Your Story, Build Relationships, and Empower Learning. Get your copy today! No significant relationship can exist without trust. 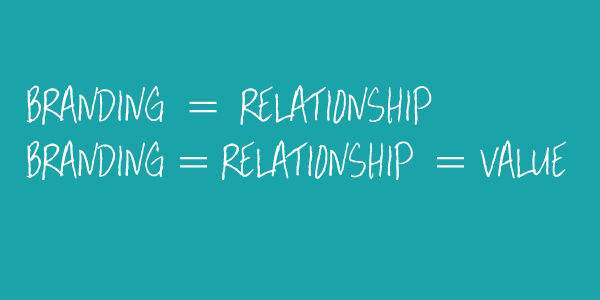 Without relationships, no significant learning occurs. As I continue to research and reflect on strategies to build powerful relationships with others, the topic of empathy has a consistent presence. In simple terms, empathy is the ability to understand and share the feelings of another. So how does this connect to leadership? I pulled a few connections from an article by Bruna Martinuzzi that address this topic. Below are some highlights. Empathy is the oil that keeps relationships running smoothly. Research by Dr. Antonio Damasio has shown people with damage to part of the brain associated with empathy show significant deficits in relationship skills, even though their reasoning and learning abilities remain intact. Empathy is valued currency. It allows us to create bonds of trust, gives us insights into what others may be feeling or thinking, helps us understand how or why others are reacting to situations, and informs our decisions. Tips to become more empathetic include listening, encouragement, know people’s names, don’t interrupt, be cognizant of non-verbal communication, smile, be fully present, and use genuine praise. Empathy is an emotional and thinking muscle that becomes stronger the more we use it. Let’s be honest. 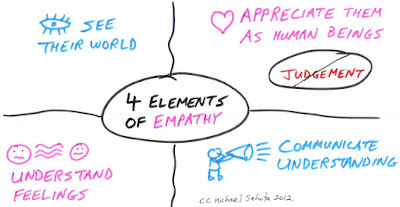 Empathy is not a typical component of core training and coursework in the field of education. It is something that we typically learn from our parents, friends, and colleagues. In my opinion, empathy should be a core component of curriculum in schools and the culture of any organization. Truth be told, this at times can be a difficult lesson for many of us to master. Talking about empathy and demonstrating it are two entirely different concepts. Our mindset and certain pre-dispositions put our own feelings and needs before others. This is not always a negative, but something that many of us would agree must change. As leaders, it is important for us to imagine ourselves in the position of our students, staff, and community members. This gives us a better perspective on the challenges and feelings of those we are tasked to serve. Better, more informed decisions can result from “walking in the shoes” of those who will be most impacted by the decisions that we make. 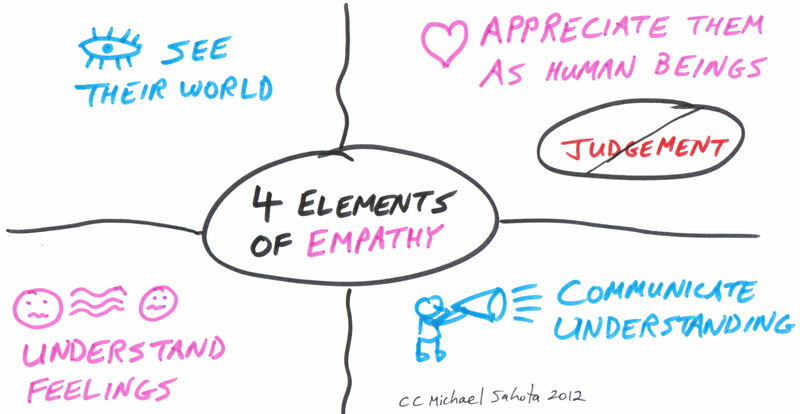 The image below does a great job at articulating four key elements of empathy. As Theodore Roosevelt once said, “Nobody cares how much you know, until they know how much you care.” A culture of excellence is created through relationships built on trust and sustained through empathy. Showing we care can be as simple as listening intently, demonstrating emotional intelligence, or being non-judgmental when others open up to us about their feelings, concerns, or challenges. However, actions that bring empathy to life can have a profound impact on others. To see what I mean check out this brief video below. As you think about your professional role as a teacher, administrator, board member, entrepreneur, or in any other field, reflect on how you can be more empathetic towards the people you work with and for. For some of our students the only empathy they might receive occurs within the schoolhouse walls. Regardless of your leadership position, understand that trust is a currency that should be valued above all else. If people don’t trust and relate to you then chances are you are a manager, not a leader. Empathetic leadership not only builds trust, but creates a culture where students want to learn and adults strive to perform their best. In BrandED, Trish Rubin and I discuss the powerful role empathy plays in the stories we share and the relationships we strive to build. Make empathy a part of your professional role. In the end you will be a stronger leader and a better person for it. The following post is adapted from BrandED: Tell Your Story, Build Relationships, and Empower Learning. Branding matters in the changing world of learning, fueled by powerful digital resources (Sheninger, 2014). It’s time to make a choice – define or be defined. Telling a powerful school story and reaching an audience have never been more possible than in today’s digital world, and never more necessary for a leader to embrace in a new world of competition and choice. Early brand adopters such as Brad Currie, Robert Zywicki, Joe Sanfelippo, Tony Sinanis, Angela Maiers, Vicki Davis, and Gwyneth Jones, are already out ahead of the pack on digital media, and they are passionate about what they do. They are inspired by their initial success and have developed professionally in ways that make them unique compared to other leaders. A brandED mindset takes professionals to the next level, adding strategic thinking and action steps for brand sustainability. The pillars of servant leadership speak to the underlying mission of brandED leaders; they define leadership as something to be shared, distributed, transparent, and focused on success and happiness. BrandED does not rest on the shoulders of one person. It is a distributed, collaborative, service-oriented school improvement effort articulated through the power of storytelling. The marketing principle that guides business brand is its drive to build relationships. BrandED educators focus strongly on that aspect. Successful school leadership in today’s digital world is fueled by connectivity. Aren’t educators always building, brokering, and sustaining relationships? Focusing on relationships is a cornerstone of any leadership effort and one that supports a brandED strategy. 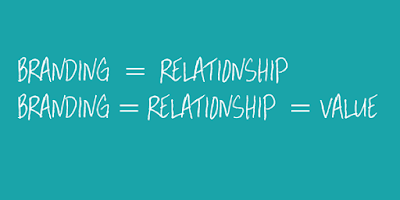 Relationship building is a never-ending process, and in education it is not a part of a “sales cycle” (Connick, 2012) but is instead a part of an “awareness cycle.” For any school leader, being relational is as important as being knowledgeable. BrandED behavior strategically focuses on relationships forged and sustained through trust. Mutual trust is a core element of brand loyalty in business and in schools, thanks to the digital age. A great workplace is created through organizational credibility, respect, fairness, and a foundation of trust (Mineo, 2014). The work involved in brandED development relies on building welcoming access in real time and online so that people feel connected and happy in their work. Access is supported by people who know that the calendar isn’t just about scheduling the day’s appointments but also about making time for a ritual of building trust. Your purposeful strategic effort to create relationships is vital. As you begin to develop your own brandED mindset and strategy, especially through a time of innovation, the following focus areas are places in which to access new connectivity for your own brand and the school’s brand. In each area, work on building relationships that promote both your brand and the school’s. Student achievement. Standardized test scores are most often used to evaluate the overall effectiveness of a school. Public relations and communication efforts focused on evidence of growth in this area and in other academic and nonacademic areas can be conveyed through social media. Doing so will help create and strengthen a school’s brand presence and convey why the brand matters. It is important to remember that this cannot be your only focus, as achievement will never tell the whole story of success (see other pillars below). Quality of teachers and administrators. Student learning and achievement are directly linked to the quality of the school staff. Stakeholders are often more than willing to move to towns with higher taxes that attract the best and brightest educators. Utilizing social media to convey staff statistics can build the confidence of any community, which has a positive impact on a school’s brand. Hire, support, and retain the best while also consistently sharing their great work. Innovative instructional practices and programs. Course offerings, curricular decisions, unique programs, and innovative instructional practices play a key role in student engagement while also having a positive impact on student outcomes (Whitehurst, 2009). Unique course offerings, curricula, and programs make a school or district stand out. The publication and dissemination of this information sends a powerful message related to college and career readiness and the ability of students to follow their passions. Extracurricular activities. Extracurricular, nonacademic activities are a valued component of any school community and help develop well-rounded students. Leaders who use social media as part of a combined communications and public relations strategy spotlight these activities to gain the attention of stakeholders. Narratives both large and small are valued as tangible evidence of the school’s worth. 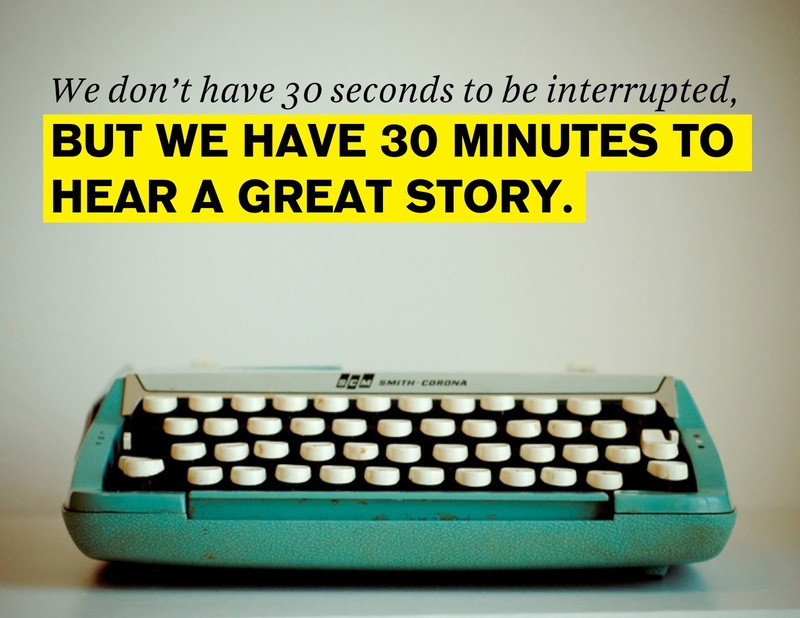 Stories come in different sizes and hold different purposes, but simply said they keep the engagement going. Sharing through big and small ideas aligned to the focus areas above will result in greater transparency that will help to build better relationships, support, and admiration for your noble work. It's time to join the brandED conversation. Mineo, L. D. (2014). The importance of trust in leadership. Research Management Review, 20(1), 1–6. Sheninger, E. (2014). Digital leadership: Changing paradigms for changing times. Thousand Oaks, CA: Corwin Press.